ON Thursday, 31st of January Amber Rudd Secretary of State for Work and Pensions visited Harlow and toured the job centre accompanied by our MP, Robert Halfon. At the end of the visit she announced that she had “seen that Universal Credit is a force for good”. Eugenie Harvey, Portfolio Holder for Community and Wellbeing described Mrs Rudd as “having a laugh”. Cllr Harvey said: “I find it absolutely unbelievable that Mrs Rudd can have reached this conclusion after visiting Harlow. I can only think she did not hear the full story of the impact of Universal Credit on many of our residents. Recent reports to the Council’s Scrutiny Committee, collated from impartial sources including the Citizens Advice Bureau, paint a very different picture. They note that 12 months on, there are ‘continued operational issues’ with the transition to the new system and consequently, people are having to wait as long as 5 weeks for a first payment. And while working families can claim back up to 85 per cent of their childcare cost, they have to find the money to pay for it upfront and wait as long as 6 months in some cases to be reimbursed. Pushing some families deep into debt. According to analysis provided to the Scrutiny Committee, rental arrears is an area of growing concern. As at July 2018, 933 Council tenants were in receipt of Universal Credit and of these, 680 – nearly 73% – had fallen into arrears. Cllr Harvey said: “Behind every statistic is a story of real-life hardship, often affecting the most vulnerable members of our communities – people with disabilities and mental health problems, not to mention families with young children. 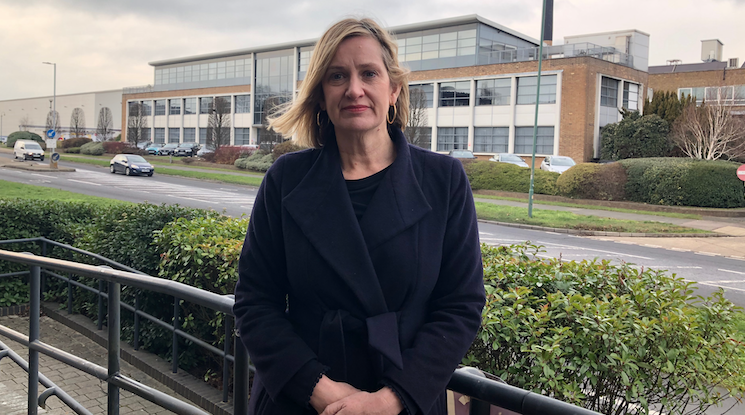 13 Responses to "Labour slam visit of Conservative minister Amber Rudd to Harlow"
In my personal opinion Amber Rudd is more welcome here in Harlow than Jeremy Corbyn and any of his undemocratic trouble making bullying MPs. recipients of the benefits, and the financial black hole that they appear to descend into. They are given the money directly to pay their own bills, so, if they choose to spend this wind-fall, supplied by the tax-payer, on things, other than rent and general bills, whose at fault ? It certainly isn’t the fault of the benefits system. If these spenders can prove genuine hard-ship they are offered interim payments to help through a sticky patch. As usual, the Mistress of Momentum has got the facts twisted. How the hell did cllr Eugenie Harvey get the role as the portfolio hold for community and wellbeing, she is never anywhere to be seen in Bush fair or Harlow, only when it suits her but then again what do the residents of Bush Fair and Harlow expect she is a Labour councillor after all. They are all the same only out and about in amongst the residents of Harlow when it suits them, like election time. She’s a daffodil, only comes out for photo shoots and the gardeners. What defibrillator ? oh, that one. It’s sad to read that yet again that the comments are only about the person and not the point of the article. This only lowers the tone of the debate and makes the article less relevant. Let’s be clear we have a wide open policy of inviting everyone to experience the unique Harlow spirit. What the actual issue is that under this new benefits system many are worse off which was the point of the councillor statement . Sadly this is a factual true statement and many agree the current system isn’t achieving what the original plan was. The poor are getting poorer and having to rely on friends family and food banks. Can I please ask everyone to enter into the spirit of debate instead of nasty personal attacks. Yes, comments should not be personal, but then again the news release issued by Cllr Harvey was unnecessarily negative – I know Labour are in opposition but is it really necessary to include the usual hyperbole? It just causes people to switch off, or attack the person! Amber did indeed visit the Job Centre and all of the comments received from the staff and the volunteers there were positive about the impact of UC. Yes, there are problems but everyone is trying their hardest to make this work. No one seems to appreciate the complexity of what is being done here – consolidating six benefits for 7.2 million people is a lot of work! One of the biggest reforms of benefits ever. Why is that Durcan, because none of you lot in the Labour party can handle the truth. Durcant, don’t always shoot the messenger. or take the public for fools. Sad to read that just because you stand to be a local councillor it’s acceptable to be personally attack. This is why so many good people don’t stand and others who feel they shouldn’t be open to offensive comments step away. Yet again the story line has been destroyed by the negative and personal attacks made against a hardworking and dedicated councillor. You lose the moral high ground and any respect anyone has. Please let’s be more grown up.debate the issue not the person. If not this important access to news will go the same way as other news outlets. whilst sitting up in their ivory towers. pattern, you didn’t bang on about this, did you ? The cheek of this man, a very very selective memory, indeed. As D.p.l states, truthfulness isn’t in your vocabulary. I’m sorry but negative politics breeds negative comments back. I’m getting a little sick and tired of only ever hearing on your Harlow that the Labour Party don’t like this and the Labour Party don’t like that, without coming up with any alternative suggestions or solutions. Then get shocked as to why people don’t want to hear it. How about Labour and the Labour council start saying, actually this works well, or that’s not how we would do it, but we propose doing it like this, or we haven’t done well at this because x and we aim to fix it by y. Saying everything that the Tories do, just because the Tories do it is bad is so utterly childish, makes an awful read and quite frankly doesn’t do anything. Start having a more positive narrative or come up with some of your own ideas rather than just saying everything is bad. The Labour party are too quick to snap. Being a councillor, if they can not stand up to or take criticism then they should not be in the position. As a former ukip Harlow councillor, I didn’t just stand up to criticism I also went through a lot of verbal abuse and all from the left wing party supporters and members such as those who have close contections to the Harlow Labour party. As a former ukip Harlow councillor, I didn’t just stand up to criticism I also went through a lot of verbal abuse and all from the left wing party and this include those who have links to the Harlow Labour party.